The time has come: Guild Wars 2: Heart of Thorns is here! If you're new or return in Tyria after a long pause, then you will find some useful tips and tricks to find your way around immediately in the new expansion. Who - as Karsten - the first time logs in Guild Wars 2 after a long time, will be wondering about the game Login rewards. The there are actually at each first visit of the day and Tyrian can get some useful commodities, craft materials or include laurels. The most valuable chest you get only when you have logged in four weeks at a time: With the chest of loyalty you will receive a permanent bonus to your gold flair and ascend or legendary craft materials, laurels or tomes of knowledge. Then the fun starts again from the beginning. So visit Tyria every day at least once. If have accepted your reward (just click on "Continue"), appears a window in which available daily successes are displayed. Available both for PvE, PvP and WvW content, but also for special events such as currently the Halloween event. You need only three of these "Dailies" master in order to be rewarded with success points. Achieved a certain number of merit points, get your reward box in which you will find, for example, Skins, laurels or permanent bonuses on your account. Anyone who has played the Guild Wars 2, will have to make focus on his return to some changes in the character development. Whether it is the choice of specialization, learning new weapon attacks or the training of skills - the developers have made adjustments all over. If you start with a dewy character, you possess a weapon skill, and your healing skill. The second attack on your weapon, there are then automatically, as soon as you reach level 2, the third attack at level 4 and so on. But it turns not only weapon skills with a free level-up. 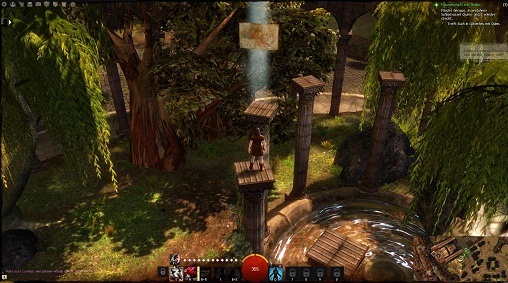 In addition to the mandatory attributes push you toward a reward window has always new game mechanics of Guild Wars 2. At level 3 you learn about where you will find your inventory and how you can participate in PvP. From level 5 you are allowed to wind up your fallen player and also get a new class skill. And with stage 12 wave a briefing on the revaluations, re Recycling and crafting. During your weapon attacks, you may have your skills only with the so-called hero points in the training window. You will find four different skill areas: Elixir, turret, Kit and gadget. If you push around your turret-training, you learn only how you can set up a healing turret that restores your life. We invest more points in this skill-circle, we can later alternatively thunder towers, which have much life and opponents take a bead, or power towers, holding the opponent in place up. Once learned, we have our new skills to the respective places in our ability to strip. In the training window, there is also the opportunity to specialize with the hero points in certain areas. You can improve the handling of firearms or optimize your efficiency with explosives. In the training window you will find the way, also your new Elite-specialization. You may only expand if you reach level 80 and finished all learning "normal" specializations. The total of 19 improvements. For the first skill, learning of the fight with the bar, a whopping 60 Hero Points will be due for physical superiority (Maximum endurance threshold is increased) you have to paid 15 more points, Channeled Elan (Channeled healing spells) would cost you 25 points. At first glance, the combat system in Guild Wars 2 looks quite simple: five weapons attacks, a healing spell, three supportive skills and an elite skill, plus get some special class abilities such as stealing. Nevertheless, the fighting in Tyria can quickly overwhelm. Firstly, because you always switch the weapon and get five new weapons attacks. Secondly, because many classes have a whole range of other attacks that are not obvious at first glance. Change the engineer on the flamethrower, you receive about five completely new attacks. In combination with the normal weapon attacks, the healing characteristics and class skills like grenade barrage or incendiary ammunition come so quickly on more than 20 skills, which you may use in combat. More skill waving when you take off about an object such as a stone from the ground. Or if you dive into the water and automatically create a harpoon. And even if you will be blown away, you get five new skills with which you regenerated about life points or a booby trap. So take the time to gradually get to know all these intricacies of your heroes. And also internalized the stamina system, thanks to quick escape with the double pressing W, A, S or D from a danger zone - in many battles in Tyria you will need this evasive skill. In addition, many items now available to you. But the so-earned gold you still have to pick up at an NPC, the Black Lion Trading Company. the lower left corner of your inventory. There you will find the purse, listed 2 in all currencies of Guild Wars. Coins: With gold, silver and copper you pay most merchants for their services, you can shop in gold but also in gems transform (or vice versa). Karma: Karma you deserve by the completion of events or during personal history. With this you can buy very different things. Some merchants offer a special piece of armor, at some there is a special foods or craft materials. Laurels: This currency you gain mainly on login rewards or completing achievements. Outputting Post you laurel only at special dealers can be found mainly in the capital cities. Where you can buy about high-level clothes for your class, miniatures or sophisticated tools. Gems: Gems gets you mainly for real money or by gold. With the blue clunkers you can buy the in-game shop around more bag slots or the second season of the living world. If you're completely new to Guild Wars 2, you shall wonder about the possible small number of quests. Indeed, there is no off the main story quests. which you pick for clients, and then settled back Autogespot. Instead you'll find anywhere in the territories cardiac events and dynamically occurring events in which your experience points and other rewards can dusting. If you want to know where the next events are waiting for you, take a look at the world map. Stop there, the binoculars on, because there is a NPC who betrays you, you'll find something to do in the surrounding area for you. In addition, important areas, waypoints, as well as viewpoints are drawn on the map. It's worth to visit all these places at least once and to cope with the events, because then you get a reward for completing the respective territory. In Guild Wars 2 you can rush with low-level heroes easily into PvP, because as soon as you enter the PvP lobby heart of the fog, you will upscale at level 80. Open for the PvP window and click the "Enter - PvP lobby". A little tip: If you want to quickly return with your low-level heroes to another zone of Tyria! Enter the heart of the fog and travel from there via the Asura Gate to Lion's Arch. There you will find more portals that bring you into the home of other peoples. But back to the PvP: Since you will transport through the junction in the heart of the mist at level 80, you should first take you time to get to familiar with the many suddenly unlocked skills. Shipyard also have a look into the "PvP Build" that you can open the top of the interface on the helmet icon. There you define about which Sigil have your weapons and amulets which want to invest. Even your specializations can be adjusted here for PvP. When you have finish making adjustments, click on the crossed swords next to the helm, to enter the PvP. There you can via "games - Arena unranked vote" plunge into the first skirmish. Alternatively, you change to the tab "game-browser", to join a game started by players. Team Deathmatch: Kill the opposing team and get first 500 points, or after 15 minutes the higher score. Conquest: Here you achieved not only by killing other players, but also by the conquering bases and completing NPCs points. Fortress: here the team that defeated the opponent wins first. Collect up to two stock pile (you can find in the center of the map) and give the starting in your barracks to summon allied door breaker and archers. At random intervals appear on the map mist essences with which you can summon powerful heroes that henceforth fight at your side. Which heroes summon, you can define under "Fog Champions" in the "PvP Build" tab.